What occasion was this giant cake baked for? Who are the Landers Bakers who produced such a massive cake? 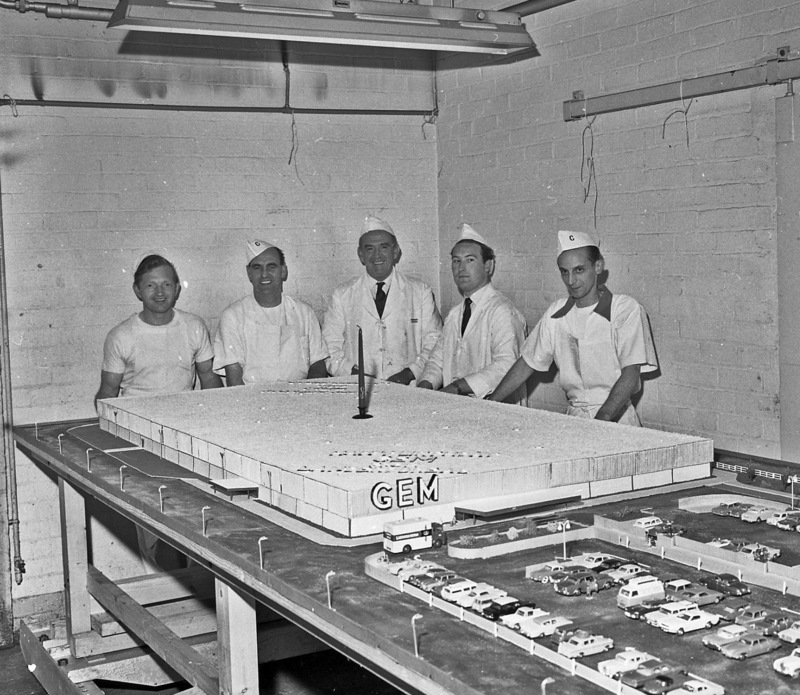 My first thought was that this cake was for the Four Seasons shopping centre due to the road, cars (including the Landers delivery van), and car park, but 1965 is much too early for the opening of the Four Seasons. Does the single candle signify an anniversary and what do the letters GEM stand for, these must be a clue? I came across this picture browsing. No one has mentioned the name of the baker on the left of the picture. I believe this is Trevor Steel. Trevor finished his working years as the store man at Mansfield General Hospital & finished at Kings Mill Hospital stores, before retiring. I believe that Charles Strutt (mentioned above) could be a distant relative of mine, I think he had 2 sons, 1 or both could have been in the navy. We would love to have a page or pages on Wainman’s Bakery, it seems you have so much of interest all our viewers/readers. it would be a good contribution to Mansfields history. I can remember that Steve….Best Wishes. Alan C.
The large cake that was produced at landers bakery is as A Curtis says. When the cake was due to be transported to West Bridgford, a wall had to have a hole made in it to extricate it with a special cradle made and then lifted out with a crane onto the veicle then transported to the supermarket. The cake weighed 1/4 ton. In the 1960s. Bread retail prices were controlled by the government, no one was allowed at that time to cut the price of bread…Any increase in the price of bread was national news, and was only increased by 1/2d at any one time. A.C. The Little Gem Supermarket opened it’s doors in West Bridgeford, Nottinghamshire, in 1964….It was taken over by Asda Supermarkets in 1966. The person in the centre of the picture is Charles Strutt. He was the Bakery production manager. Very good manager whom I worked alongside in cases of emergences. The other person next to Charlie, (wearing a tie), was a management trainee. The other three persons were bakery operatives. The outside two people played cricket for the Landers Cricket Team. This very large cake was the idea of the then general manager of the bakery Ted Morris. It was baked in honour of the first anniversary of the very large supermarket in West Bridgeford, Nottingham called Little Gem. The cake was made to be a replica of the actual building of the supermarket, hence the cars and car park. The cake of course was cut up and given to customers. I am not sure that Percy Lander would have approved ?? I think he might have though ! !